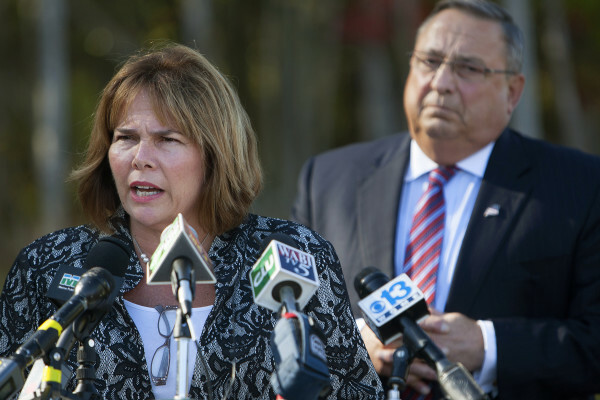 Maine Commissioner of Labor Jeanne Paquette (left) addresses the media during a press conference with Gov. Paul LePage regarding the announcement of the Verso paper mill closure in Bucksport in October outside Maine Military Supply in Holden. Maine faces significant economic obstacles posed by the dual challenge of our aging population combined with the economic shift of the past two decades — a shift that has left some members of the workforce without the skills to compete in the new economy. Workforce development addresses both of those obstacles by training displaced workers and tapping previously underutilized labor pools, helping people return to school and earn a credential that qualifies them for a new career. It’s how Maine ensures that it has a globally competitive workforce, a high priority for Gov. Paul LePage and something that the State Workforce Investment Board and the Department of Labor have made great strides with over the past four years. Maine’s Workforce Investment Act State Plan places a heavy emphasis on demand-driven training through a concept known as “industry partnership.” In its basic form, industry partnership brings together businesses and industry that have similar hiring needs with strategic partners that can deliver education, training, and support services. Working together, they identify a target population and develop career pathways that deliver a shared workforce to that sector. Our goal is to connect the jobs that employers need to fill with our long-term unemployed, underemployed and new workers. By educating and training these residents with in-demand skills of specific industries, we are helping them move from economic uncertainty to self-sustaining independence while at the same time providing a workforce pipeline for employers and helping grow Maine’s economy. This job-training focus forms the bridge between economic development and welfare reform. Instead of seeing discouraged workers turn to welfare for support, we are connecting them with new careers. By partnering with such agencies as the Department of Health and Human Services, Department of Education, Department of Economic and Community Development and training and education organizations, we are reconnecting people who have not worked in six months or longer with career alternatives, as in our successful apprenticeship, health care training, welfare-to-work and vocational rehabilitation programs. Parts of Maine’s workforce development system are federally funded, but other state programs and local partners play critical roles in overall reach and effectiveness. Developing a globally competitive workforce is a team effort with a vitally important payoff. These initiatives create a brighter future for Mainers: good jobs, good wages, career ladders and more prosperity. The administration has undertaken many initiatives over the past two years, including the adoption of the new WIA State Plan that implements these best practices. During the last six months alone, we have launched more targeted programs. — Data provides valuable feedback for policymakers about needs and effectiveness and helps job seekers make informed career and training choices. We publicly launched the first phase this summer — the Maine Workforce Data Quality Initiative, which measures and evaluates employment and earnings outcomes by degree attainment from Maine’s university and community college systems. — Maine’s Departments of Labor and Education hosted an Industry Partnership workshop in October to elevate the conversation about addressing employer‘s workforce needs through partnerships. Almost 200 people attended from across the state, brainstorming industry-partnership project ideas for the state and the regions they represent. — The Industry Partnership Assistance Collaborative is developing guidelines for a regional Industry Partnership Grant program, with funds earned by Maine through local performance of federally funded workforce investment delivery and Adult Education programs. — The two-year Job-Driven National Emergency Grant awarded to Maine’s Department of Labor in July supports industry partnership training efforts in energy, health care, composites and other industries and targets the long-term unemployed. — Prompted by manufacturers in Maine, the State Workforce Investment Board has established a workgroup to look into modeling Connecticut’s highly successful Manufacturing Academy for training. While industry partnerships have occurred in Maine and other states in some form or another over the years, going forward, this will be common practice. Businesses that familiarize themselves with this model as the system moves to demand-driven skills training will be ahead of the curve. We encourage employers to reach out to their local CareerCenter and engage us in how, together, we can help you grow and help Maine citizens access careers with a bright future. The LePage administration, the Department of Labor, the State Workforce Investment Board and our workforce development partners have made great strides in addressing our state’s economic and workforce challenges and will continue to engage businesses in this process. Businesses must be at the table because government cannot create jobs. Fred Webber is chair of the State Workforce Investment Board. Jeanne Paquette is commissioner of the Maine Department of Labor.